Rita made her first jump in 1999 with her family. 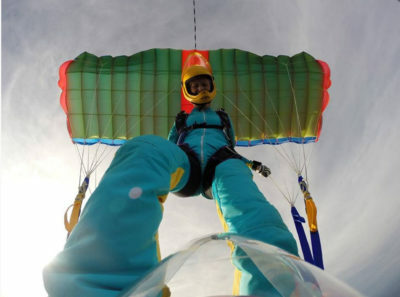 She immediately fell in love with the sport and the people and started packing parachutes to pay for her training. She soon was licensed. In her spare time, Rita LOVES to run – and not just run…. she owns about 8 pairs of running shoes, which she rotates, and buys about 4 new pairs per year. She runs between 70 and 100 miles each week, preferably on single track trails. 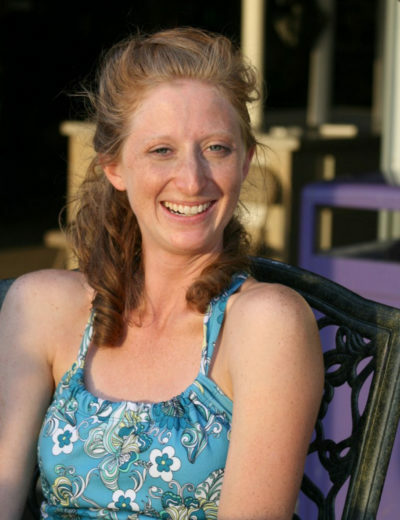 Her goal for this year is to compete in over 12 ultra marathons and triathlons. Initially, it was the thrill of something new and challenging that required a different level of skill, control, and awareness than other activities I was already familiar with. I had been in gymnastics as a child and had never found anything comparable to my enjoyment of sports until skydiving. My dad always wanted to go skydiving, so my family and I took him for father’s day one year – and I fell in love. That’s a tough question. 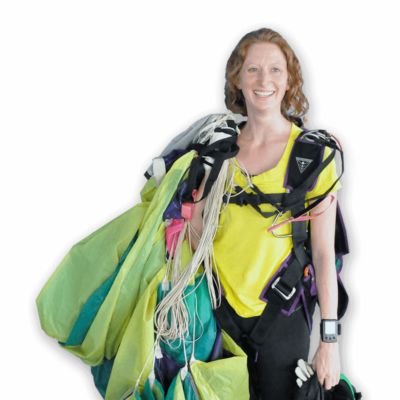 Several come to mind: my AFF test jumps; the one where an AFF student tumbled out of control; playing “frisbee Rita;” my first tandem as an instructor; jumping out of different things such as bi-plane/helicopter/hot air balloons – there are a lot! I don’t know if one person inspires me. I am inspired every day by the people around me when I witness them doing kind acts for another person. 5. What’s the coolest thing that has happened to you in the last five years? The pinky party. I felt loved beyond belief. (Ask Rita about the pinky party – it’s a great story). 6. What attracted you to long-distance running, and how many races have you run? I have no idea how many races I have done! I enjoy long-distance running for similar reasons I enjoy skydiving: it is more of a mental hurdle than physical – and you meet great people. I enjoy pushing myself to see what I can accomplish when I really put my mind to it. I don’t enjoy settling for less than what I can do, and you don’t know what you are capable of until you try. Does that make sense?! Ummm… What you see is what you get. I don’t know. Maybe that I chose to become a marriage and family therapist after volunteering in orphanages in Russia… Or, I love traveling to almost anywhere and get lost a lot! 8. Do you have any other interests outside of your occupation and skydiving? Running, swimming, biking, traveling, spending time with friends. Reading too (I am not cool and don’t own a tv or know anything about pop culture). 9. What’s next for Rita Kempfert? That’s wide open and the sky is the limit! But definitely my tandem rating is the next big thing.